The essential feature of British imperial method: to blame its crimes on others, and rally its colonial victims, such as the Arabs, against the United States. The core of British imperial method has always been to rule through orchestrating conflict and war, made possible by systematically organizing, funding, protecting, and deploying the most irrational and violent, opposing, sides, of each and every important conflict, anywhere in the world. Commonwealth of Nations with it's British Overseas Territories and Crown DependenciesThe Commonwealth of Nations consists of 53 member states and it is the successor of the British Empire. Queen Elizabeth is the monarch of the Commonwealth of Nations and the Commonwealth realms which consists of 16 member states. It was once said that "the sun never sets on the British Empire", and the British Overseas Territories still extend to every geographic region of the world, with the Caribbean Overseas Territories in North America, the Falklands in South America, Saint Helena and Dependencies in Africa, Pitcairn in Oceania, Gibraltar in Europe, British Indian Ocean Territory in Asia, and South Georgia and the South Sandwich Islands in Antarctica. The 14 British overseas territories are: Anguilla, Bermuda, British Antarctic Territory, British Indian Ocean Territory, British Virgin Islands, Falkland Islands, Gibraltar, Montserrat, Pitcairn Islands, Saint Helena, Ascension and Tristan da Cunha, South Georgia and the South Sandwich Islands, Sovereign Base Areas of Akrotiri and Dhekelia, Turks and Caicos Islands. The head of state in the overseas territories is the British monarch, currently Queen Elizabeth II. The Crown Dependencies are possessions of The Crown in Right of the United Kingdom, as opposed to overseas territories or colonies of the United Kingdom. They comprise the Channel Island bailiwicks of Jersey and Guernsey and the Isle of Man in the Irish Sea. They are possessions of the British Crown they are not sovereign nations in their own right, and the power to pass legislation affecting the islands rests ultimately with their own legislative assemblies, with the assent of the Crown (Privy Council). (Source: Wikipedia). Now the British Empire today, contrary to what most people are misled to believe, is still an empire, but of a very special form. It's called the Commonwealth. Most people don't know how the British Empire functions. The British Parliament is a joke. It's an adaptation, a reform of the Monarchy. It does not run the Monarchy. The Queen runs from the top down, through a Privy Council. Number One on the Privy Council, after the Queen, is a whole lot of other people, about 500. These 500 people run the British Empire, including the apparatus of its old Colonial Office. The Colonial Office was never disbanded. They call it the Overseas Development Office now. The Crown Agents who ran the colonies still function. They operate whole countries around the world. In the minds of the political, industrial, and intellectual elites of the overwhelming majority of nations of the world today, there exists a deadly dangerous myth: that the British Empire has disappeared from the face of the Earth; and that Great Britain, the United Kingdom, is of little consequence in world affairs. 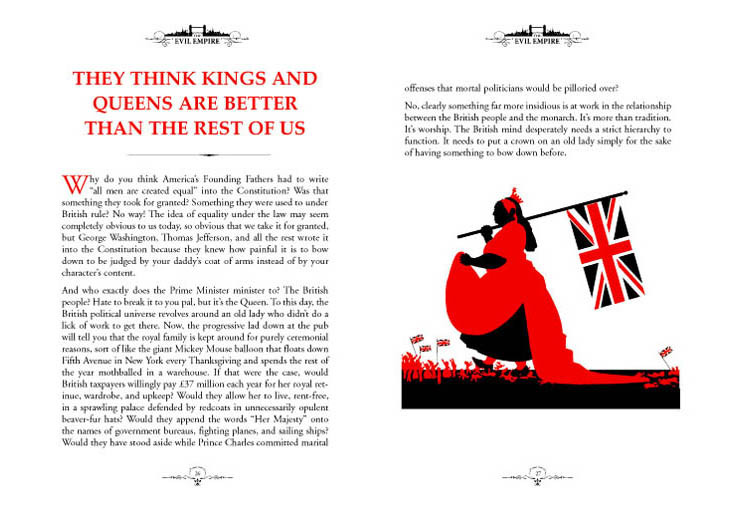 According to this fairy tale, Britain's royal family is a powerless relic of days gone by, collecting its modest pension, fulfilling its ceremonial obligations, and, perhaps, drawing in a few tourist dollars, to justify its upkeep. In the extreme version of this Big Lie, today's Britain is cast in the role of a benign force in world affairs, a "friend of the downtrodden" and "diligent defender of human rights." The authorship of both of these complementary hoaxes - the demise of the British Empire, and its replacement by the U.S.A. as the new "Great Satan" - is traceable to Britain's own vast propaganda and intelligence apparatus, associated with such institutions as British Broadcasting Corp., Reuters News Service, the Hollinger Corp., the Tavistock Institute, the Mont Pelerin Society, Oxford and Cambridge universities, the British Commonwealth, and His Royal Highness Prince Philip's World Wildlife Fund (WWF, now the World Wide Fund for Nature). The British Empire is very much alive and well today. Behind closed doors at such locations as Chatham House, the London headquarters of the Royal Institute for International Affairs (RIIA), blueprints for the consolidation of one-world empire, drawing upon the resources of the British Commonwealth and the United Nations Organization (UNO), have already been drawn up, and construction is under way. The United Kingdom itself has very little to do with the new British Empire. England, Scotland, Wales, and, especially, Northern Ireland, are today little more than slave plantations and social engineering laboratories, serving the needs of a collection of families, numbering no more than 3,000-5,000 people, who live and work in and around the City of London, a one-mile-square financial and corporate district, which represents the greatest concentration of financial power ever assembled in one location. These families constitute a financier oligarchy; they are the power behind the Windsor throne. Among their own ranks, these financier oligarchs refer to themselves as the Club of the Isles, after the original "Prince of the Isles" Edward Albert (King Edward VII), the son of Queen Victoria, who orchestrated the Crimean War, the Opium Wars, the Russo-Japanese War, and World War I, to consolidate Britain as the primus inter pares (first among equals) of the European monarchies and feudal families. The City of London dominates the world's speculative markets. A tightly interlocking group of corporations, involved in raw materials extraction, finance, insurance, transportation, and food production, controls the lion's share of the world market, and exerts virtual "choke point" control over world industry. "Queen Elizabeth II the largest landowner on Earth." The islands of the Caribbean have long played a key role in the British Empire's assault against the United States. The Brits set up the offshore banking centers in the Caribbean to pave the way for the explosion of narcotics out of Ibero-America, then used the proceeds from the dope trade to take over the U.S. financial system. The most important of the Caribbean offshore financial centers is the Cayman Islands, a British Overseas Territory run by a royal governor appointed by Queen Elizabeth II. The Caymans are mainly a mail drop and regulation-free zone, a place where hot money is welcome and few questions are asked. Companies register themselves in the Caymans in order to take advantage of the tax breaks, lax regulations, and secrecy provided by the British. It is well known in law enforcement circles that the dope trade would quickly choke on its own cash were not a significant portion of the global financial system devoted to money laundering, and the offshore centers in the Caribbean were set up to facilitate the South American drug trade, and have expanded with it. Overseeing the Caymans financial system are a brace of imperial operatives. The royal governor, Stuart Duncan Jack, is a knighted Commander of the Royal Victorian Order. The Cayman Islands Monetary Authority is run by Timothy Ridley, who was made a knight of the Order of the British Empire. The Center for Economic Growth is run by Richard Rahn, a member of the oligarchic Mont Pelerin Society. The British use the UK media for mass psychological warfare. The UK media is carefully manipulated and directed in order to create and mold popular opinion. The center of this mass psychological warfare apparatus is based outside London in the Tavistock Institute.